From the day she arrived Jan. 18, 1952, Helen Dorothy Pettypiece was a special girl. Helen was born with Down's Syndrome and little was known about the condition in the 1950s. As was customary at that time, her parents were advised to send their baby girl to an institution for care. Helen's mother Eleanor and father Brien would have none of that. "Helen was a sweetheart to have in our family,” her mother said. “Just by knowing Helen, she interested more people in learning about this handicap." Four more girls – Nancy, Kathy, Joy and Janice – completed the family. When it was time for Helen to start school, her family rallied with others to raise funds for Sun Parlour Junior School for special needs children in Essex County. As an adult, Helen loved her three-wheeled tricycle and, after the family moved to Niagara Falls, she could be seen taking neighbourhood children around in the back basket. Helen loved camping, dancing to Michael Jackson, Elvis and The Monkees, going on roller coasters and travelling with her parents to Myrtle Beach, Mexico, Oregon and California. Helen was also athletic and competed in the Special Olympics, first in running and broad jump, then later as an alternate for her bowling team. Her favourite hobby was playing with her ever-growing Barbie doll collection. "The longer and blonder the hair, the better," sister Nancy Hicks said. One of the qualities admired and remembered most by family members was how Helen would advocate for herself when facing discrimination. An incident during summer vacation still resonates with Nancy. "We were camping with our grandparents and whenever we walked past other sites, they would jeer,” she said. “Helen walked over and shook their hand, saying 'Hello, I'm Helen Pettypiece.' It changed the whole atmosphere." Helen was known to surprise people with her sense of humour. "She was with a psychologist who was testing her speech and he wanted her to say butterfly," her sister said. The therapist got Helen to repeat the word butter and then fly independently. After several attempts, she still said flutterby. "On the third try, he asked her to say butter again and she said ‘Parkay’. He laughed, surprised at the abstract connection she had made." 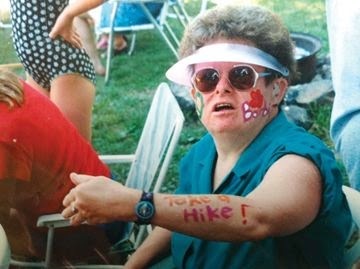 Helen was known for her sayings and liked to tease her friends who weren't behaving, telling them to "take a hike" or that they would be thrown "into the lake with their clothes on." One summer, the saying became a reality as the family literally jumped into the water together with their clothes on, for fun at a cottage. It became an annual, end-of-the-summer tradition. Her family fondly recalls Helen’s creation of the word ‘dearheart’ as a term of endearment for the special people in her life. The word means a lot to her family, as they miss their dearheart Helen. Helen died April 17, 2014. She was 62.